The classic Wapta Traverse runs roughly north-south across the expanse of the Wapta and Waputik Icefields passing by four ACC huts. This version begins at Bow Lake stopping at Bow Hut for two days, Balfour Hut, and Scott Duncan before dropping back to the highway through Sherbrooke Lake. The Wapta Traverse - the Classic Rockies Hut Traverse! Our trip begins in Canmore where we'll meet on Monday morning and drive out to Bow Lake with a brief detour en route to drop off our vehicle at the trail's end at Great Divide Lodge near Lake Louise. 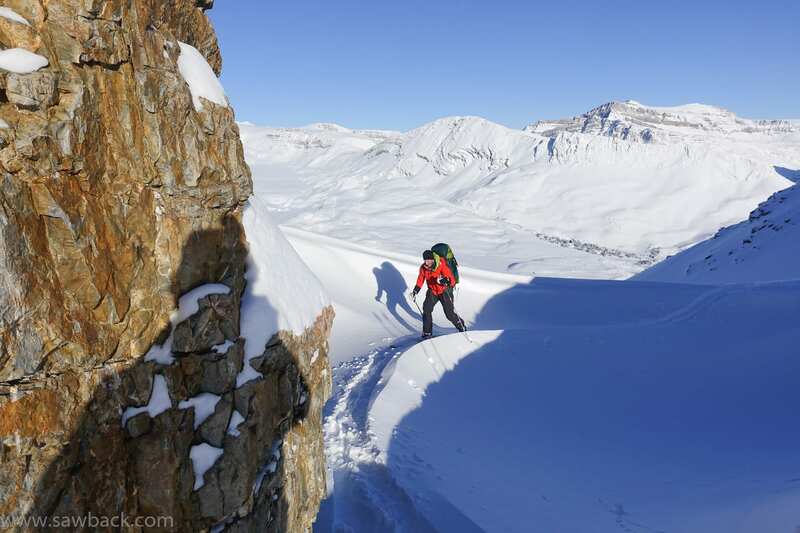 This itinerary replaces the Peyto Hut with an extra day at Bow Hut, giving us more time to explore the incredible ski mountaineering available instead of putting our heads down and charging through the traverse. We will meet for breakfast at the Canmore's Summit Cafe at 8:00 am on Monday, April 29. After breakfast we'll have a look through your equipment to make sure everything is in order as well as distribute group equipment. I look forward to spending the week together with you and exploring the amazing ski terrain that the Wapta Traverse has to offer! April is the best month to do the Rockies hut traverses. Early April is likely to be a bit cooler and have powder skiing even on the solar aspects but May and even June have good ski travel conditions in the alpine. The Rockies has a thinner snowpack than the Selkirks or Coast mountains, but by April the snowpack tends to be robust and the crevasses well covered. Expect temperatures in the -10C to 0C range, but be prepared for lows as cold as -20C or highs up to +5C! 8:00 am - Introductions over breakfast at the Summit Cafe. After breakfast we'll do a quick equipment check and distribution of group gear and food. We'll stay an extra night at the Bow Hut to enjoy the outstanding ski mountaineering in the area. The ski over to Balfour Hut is spectacular and typically brings us up and over the Olive-St. Nicholas Col. A quick lunch stop at Balfour Hut is followed by an afternoon ski objective like laps on the Diablaret Glacier or the Balfour Glacier. The trip over the Balfour High Col is usually the highlight, and definitely the crux, of the trip. We'll ascend over heavily crevassed terrain adjacent the stunning serac-fringed east face of Mt. Balfour. After attaining the col, if conditions permit, an ascent of one of the nearby peaks is possible. All good things must come to an end. From the Scott Duncan Hut it takes about an hour of gentle climbing to come to the Shark's Fin. From there it's mostly downhill to get to the bottom of Niles Creek where gurgling creeks in flood and the smell of spruce trees presents a sharp contrast with the alpine world we settled into during the trip. About five hours of travel in total brings us back to the car. The run up to Bow Lake to pick up our other car takes less than half an hour, so about an hour detour in total out of our way -- no big deal! Expect to be back in Canmore for dinner time, by 18:00.